The Australian Gliders were unable to hold off a hot-shooting Canadian side, going down 84-72 in an overtime thriller. It proved to be a fast start from both sides, with Canada moving into a full-court press early in an attempt to keep the Gliders’ High pointers out of the paint. Coach David Gould called a timeout halfway through the first to try and slow Canada’s frenetic pace down, with Georgia Munro-Cook scoring the first basket out of the break. Coming off the bench, Munro-Cook became the main offensive target for the Gliders, with Kylie Gauci handling the applied pressure and find the High pointers late in the quarter to reduce their deficit heading into Quarter time. Amber Merritt, last games offensive dynamo was found in foul trouble early, heading to the bench with two personals. Merritts counterpart, Annabelle Lindsay, was given an opportunity off the bench and did not disappoint, hitting her first shot of the game late in the. 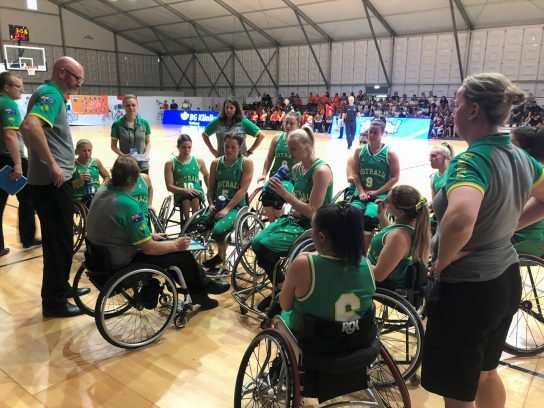 The first break saw Canada continue their full court press, however, some team passing from the Gliders was able to crack the pressure, finding their players open, with Lindsay hitting three in a row to provide a spark for the Australians. The chair speed of Kylie Gauci important for the Australians as they continued to work through the Canadian press, with long the shot of choice for the Gliders. Amber Merritt quickly obtained a third personal foul, creating headaches for Coach Gould, however, the energy of Anabelle Lindsay was able to make up for it as she was able to intercept a and find Leanne Del Toso down the court for important late points. The Second half began with a smooth inbound play run by the Gliders, finding a fast moving Del Toso cutting to the basket, continuing her impressive scoring from the second quarter. Canada and Australia were trading baskets to start the third quarter, with Merritt, Del Toso and Crispin having an impact on the scoreboard as the Gliders cut their deficit back to one point. Cobi Crispin looked unstoppable through the third as she was able to weave her way through a tough Canadian defence to find shot after shot under the basket. A three from Canada’s shooting powerhouse Arinn swung the momentum back in favour of Canada late in the third, while Merritt once again headed to the bench after a foul, bringing Lindsay back into the game. Lindsay would provide some much-needed energy and aggression for the Gliders, tipping passes and using her size to interrupt shots from the Canadian Highpointers, while on the offensive end she found her stroke hitting two in a row to cut down Canadas lead to just five. Taking it upon herself to lead her team in the fourth. Lindsay hit the first shot of the final term, the Gliders were able to cut Canada’s lead to only three before hitting another to make it only a one-point ballgame. The fourth quarter was a shootout between Canada and Annabelle Lindsay, as the young star was the only Glider who was able to find the bottom of the net on a regular basis, while Canada’s Young was unstoppable. A reverse layup from Clare Nott would provide a slight momentum shift for the Gliders, with Crispin following suit to bring Canada’s lead back to within reach of the Gliders. Crispin was able to use her experience to lead her team through the final minutes, taking an important charge before Lindsay found Sara Vinci under the basket who made no mistake hitting her first shot of the game, giving the Gliders the lead with 55 seconds left in the game. Shortly after, Crispin was able to make an important layup to push the lead out to three points with the clock in their favour. Young was able to prove why she is one of the most dangerous scorers in the women’s competition by hitting a three from the top of the arc to tie the game with only 20 seconds left. Vinci hit one of two free throws following a bonus foul from Canada, putting the Gliders up by one point with only six seconds left on the clock. A foul on the siren by the Gliders gave Canada a chance to steal the game, sending Melanie Hawtin to the line who proceeded to hit one of two sending the game into overtime. Amber Merritt found herself back on the court after struggling with fouls through the game and scored the first points of extra time. Trading baskets through the Overtime period, Sarah Vinci was able to interrupt Canada’s flow with a steal, while Amber Merritt continued to lead the offensive charge for the Gliders. Following an unsportsmanlike call, the Gliders were able to force a shot clock violation to regain possession, however, Merritt would foul out soon after sending Canada back to the free-throw line which would create a two-possession game for the Gliders. A three-point attempt from Lindsay would not go as the Gliders were forced to foul and send Canada to the free-throw line once again where Young would put the game beyond reach. Next up the Gliders face Great Britain who remains undefeated in Pool A after defeating Spain prior to the Gliders' game!